The action potential generated at the motor end plate region spreads along the membrane of skeletal muscle cell and into the T tubules. The T tubules contain dihydropyridine receptors that connect to the Ca++ channels of sarcoplasmic reticulum. Depolarization of T tubules opens the sarcoplasmic reticulum Ca++ channels. Calcium exits the sarcoplasmic reticulum and diffuses through the cytoplasm. Contraction results from the interaction of the actin and myosin filaments, a process described as the sliding filament mechanism. The sequence of the interaction of the actin and myosin proteins is shown in Figure 5-6. The troponin C component of the actin filament binds Ca++ and exposes the active sites of the actin protein. Actin now binds strongly to myosin (1), and the myosin filament heads pivot (2), using previously hydrolyzed ATP as an energy source. This pivoting generates a “power stroke,” sliding the actin filaments along the myosin filaments toward the center of the sarcomere and causing the sarcomere to shorten. Pivoting also releases Pi and ADP (3, 4) and allows new ATP to bind the head of the myosin (5).The binding of new ATP detaches the myosin from the actin (6). The myosin hydrolyzes ATP, and the myosin head stores the energy until bound again by actin. The process repeats until Ca++ is resequestered or ATP stores are depleted. ATP used for muscle contraction and active transport of ions comes from phosphocreatinine, glycolysis, and oxidative phosphorylation. Phosphocreatinine is the first energy store accessed and provides up to 10 seconds of energy. The high- energy phosphate on the creatinine is hydrolyzed during the resynthesis of ATP from ADP and Pi. Skeletal muscle stores of glycogen provide the next pool of energy, as anaerobic glycogenolysis allows the replenishment of ATP. The final— and most abundant—energy source is the mitochondrial oxidative phosphorylation. This process depends on the number of mitochondria and the availability of O2. The excitation contraction process stops when Ca++ is resequestered in the sarcoplasmic reticulum. The SERCA (sarcoplasmic and endoplasmic reticulum calcium ATPase) moves Ca++ from the cytosol back into the sarcoplasmic reticulum against a significant concentration gradient, thus requiring ATP for function. Free [Ca++] within the sarcoplasmic reticulum is buffered by Ca++ binding to the proteins calsequestrin and calreticulin. Smooth muscle is so named because it has no visible striations. Its contraction is involuntary. It is found in the walls of hollow organs (e.g., digestive tract, blood vessels, urinary bladder) and other areas (e.g., the iris). Smooth muscle is controlled by the autonomic nervous system, hormones, and intrinsic factors in the organ. Smooth muscle fibers are smaller and shorter than skeletal muscle fibers. Multiunit smooth muscle is primarily under neural control. This is characteristic of vascular smooth muscle and ciliary muscles and iris of the eye. Single-unit smooth muscle is usually made up of cells that are coupled by gap junctions, allowing ions and action potentials to pass between adjacent cells. This arrangement allows the entire sheet of smooth muscle to function as a unit, or a syncytium, and is characteristic of GI smooth muscle. Smooth muscle uses actin and myosin filaments for contraction.The mechanism, illustrated in Figure 5-10, differs from that in skeletal muscle. Smooth muscle has tropomyosin but lacks troponin C. Calcium acts through calmodulin to activate myosin light-chain kinase to phosphorylate the myosin heads. This increases myosin ATPase activity. The calcium/calmodulin complex also uncovers the actin-binding site by binding to and phosphorylating calponin. Myosin hydrolyzes ATP, and the released energy causes the myosin head to pivot. Contraction develops more slowly but lasts longer than skeletal muscle. The actual rate varies greatly between groups of smooth muscle. ATP usage is much less than for a similar contraction of skeletal muscle. Calcium flux is the primary ionic event, and sodium plays a smaller role in smooth muscle action potentials. Extracellular Ca++ directly activates smooth muscle actin, whereas the sarcoplasmic reticulum is the primary source of Ca++ in skeletal muscle. Some smooth muscle uses sarcoplasmic reticulum to enhance the contraction from extracellular Ca++. Contraction ends when Ca++ is pumped out of the cell or back into the sarcoplasmic reticulum. Some smooth muscle shows spontaneous depolarization of the membrane potential, called a slow wave. Slow-wave depolarization can reach threshold and initiate an action potential. The rate of depolarization determines the frequency of action potentials. In regions such as the stomach, slow-wave generation can act as a pacemaker, setting the rate of contraction for the organ. Multiple interacting mechanisms mediate the excitation- contraction coupling for smooth muscle. Stretch opens stretch-sensitive channels, depolarizes smooth muscle, and can initiate contraction. Cell membrane receptors respond to a variety of ligands, and working through inositol-1,4,5- trisphosphate (IP3), stimulate sarcoplasmic Ca++ release and smooth muscle contraction. Hormones that increase cAMP can release Ca++ from intracellular stores and cause contraction without causing an action potential. Alternatively, some ligands promote the entry of extracellular Ca++, directly stimulating contraction. The calcium/calmodulin contractile mechanism depends on protein phosphorylation and consequently is sensitive to modulation by multiple kinases. In contrast to skeletal muscle, nerve activity can initiate smooth muscle contraction without causing action potentials. Neuromuscular junctions are more difficult to identify than in skeletal muscle. Neurotransmitters are released from axons and diffuse to the smooth muscle cell. The ability of nerves to initiate an action potential depends on the amount of neurotransmitter released and the amount of depolarization required to reach threshold. Acetylcholine stimulates contraction in some smooth muscle and relaxation in other smooth muscle types through the release of nitric oxide. 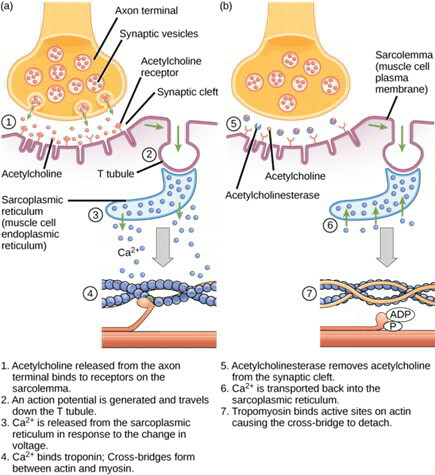 Acetylcholine-mediated parasympathetic activity and norepinephrine-mediated sympathetic activity often have opposing effects on smooth muscle.